BandCamp Season 5 is on! Now enjoy the camping experience every weekend until April’ 19! 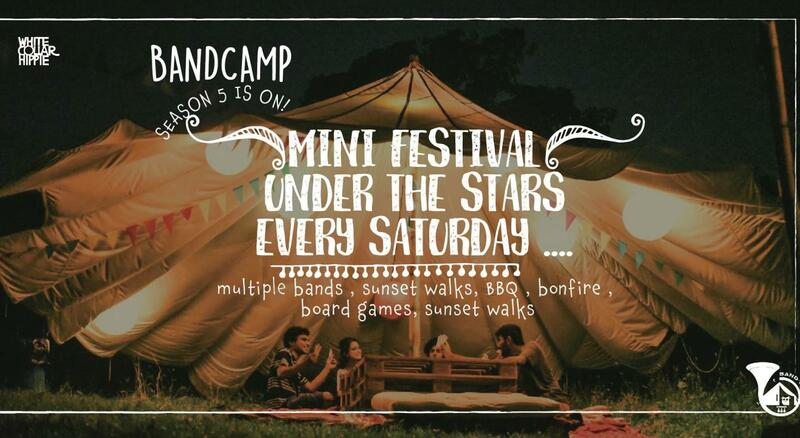 Music Under The Stars is BandCamp's own little way of taking you out of the city hustle on a Saturday night and making you experience great live music in the middle of nature. There is a naturally sculpted amphitheatre at the campsite that's perfect to lay back on and count stars, while listening to bands play your favourite tunes. The music ranges from indie, blues, funk, RnB, jazz to rock and pop! There will also be bonfires, a sundown barbeque, a village sunset walk, and some great food! The campsite has large grounds and they’ve added hammocks, books, and games to ensure that there is something for everyone. A stone’s throw away from the city, BandCamp is located off Gorai Beach. Its layout lets you enjoy nature and also have your privacy even though it’s a bustling campsite. Expect tents, sleeping bags and camping goodies, unwind in the main area, or walk around the fishing village down to the sea anytime. Since Uttan is a coastal town (home to the Koli community), meals are freshly made by locals. BandCamp is best suited for groups, solo campers, families, corporates, couples and pets. Basically, everybody! You can even attend their Movie Nights on Fridays, or weekend workshops on capoiera, photography, fitness, poetry and so on. Formed in 2015, this five-piece folk/fusion alternative rock band, started composing songs that depicted the various hidden aspects and emotions of this world. And that is what prompted them to name their band Aankh Micholi. The band comprising Osho, Bharat Chandore (drums, percussions), Hansel Dias (bass), Akshay Dabhadkar (keyboards, production) and Pankaj Pathe (guitars) are very interactive. Justh is a singer-songwriter creating original Hindi songs and is working on his first album. His interest in melodies and poetry has led him to this genre of music. His music comes from a space of deep rooted soul emotions. He has performed in places like Kulaks, Los Angeles, The Habitat, Mumbai and more. Band performance and/or movie screening. Clean and well-functional loos and showers. House full of board games, books, etc for entertainment. Beautiful walks, conversations and memories. Bonfire, which you can also help build. You can drive down to the campsite and put the location as: Bandcamp by White Collar Hippie. A cab from anywhere in Mumbai will typically cost you ₹ 400-1000 and will get you right to the campsite. Best options: Uber, Ola, Meru. Drop Location: U-Tan Sea Resort. Take a train to Bhayander, get out on the west side and then a rickshaw (₹ 180) to U-Tan Sea Resort, Chowk, Uttan. Or stake a sharing rickshaw to Uttan Market (₹ 25 per seat) and then another rickshaw to U-Tan Sea Resort (₹ 10 per seat). The campsite is right behind the resort. You can take the Bus No. 1, which will be your cheapest option. From Borivali, take a ferry from Gorai Creek which will get you to Gorai Village. Hire a rickshaw directly to the resort or take a bus to Uttan and thereafter, Bus No. 1 to the resort.